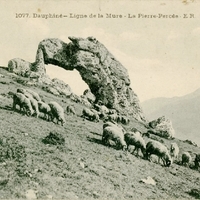 A postcard depicting a view of a pierced rock and a shepherd herding sheep from the La Mure railway line, which was built in 1882 to haul coal and was electrified in 1903. Until 2010, the line itself operated as a tourist attraction, but a landslide blocked one of the tunnels and it is unclear if or whether the line will re-open. “Ligne de la Mure Postcard.” RICHES of Central Florida accessed April 25, 2019, https://richesmi.cah.ucf.edu/omeka/items/show/6647.